There’s nothing like a relationship between a child and his or her father. 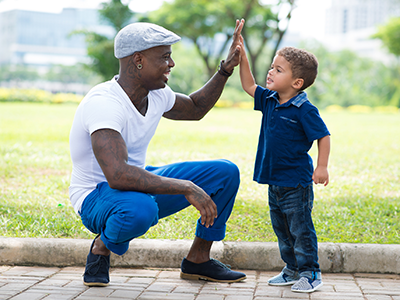 Dads provide insight into the “real world” through tone and open-ended dialogue. Wendy Mogel, author of VOICE LESSONS, shares why a father’s role is so important, especially when he speaks. A toddler and his dad are ambling along my neighborhood’s main street on Sunday morning when the boy sees something he wants. He smiles, releases his father’s hand, and runs ahead to a bookstore. He bangs on the glass door with a small fist. Dad: That’s right, Jeb. That’s the bookstore. It’s closed today. Jeb stops smiling and starts pounding. Dad: I know. It’s fun in there. That’s where we go for story time. Let’s look inside. See? No one’s there today, but we’ll come back again tomorrow when it’s open. The settings, posture, pace, social expectations, and language of mothers and fathers teach different, equally valuable skills. Mothers’ style promotes social learning and bonding, while fathers provide a bridge to the outside world by using a more adult tone, a different lexicon, and more open-ended dialogue. Studies show that when fathers hold a baby in their lap or wear a versatile carrier, they more frequently choose to face the baby outward toward the passing scene than do mothers, who face the baby toward their own body. It’s a fitting metaphor for the way time spent with Dad broadens and enriches children’s experience throughout their lives. Again in my neighborhood: A dad kneels at eye level next to a two-year-old in a stroller. They watch as workmen use a jackhammer to break up a driveway across the street. Dirt and chunks of concrete fly. The pair are mesmerized, equally appreciative of the noisy, dusty spectacle. Fathers bring to child-rearing a sense of adventure and taste for risk that is often at odds with mothers’ natural urge to protect and plan. Dads take kids on buses and trains not only with the goal of reaching a destination but also to share the thrill of traveling in large vehicles with lots of people. They follow impulses to explore, to seek, to be on the move and be in the moment even without packing extra binkies, wipes, and snacks. When they encounter a challenge, the children learn how to deal with the unexpected by watching Dad. Lynne Vernon-Feagans studies the psychology of literacy and early language development at the University of North Carolina. Her work reveals that when fathers use a diverse vocabulary in interactions with their infants, the children have more advanced communication skills at fifteen months and more advanced expressive language development at thirty-six months. Even if Mom and Dad have equivalent vocabularies, the children learn words more readily if Dad has been, regularly interacting with them. The researchers believe this might be because mothers generally still tend to spend more time with their children than do fathers. Mom can recite Busy Penguins in her sleep, so her commentary on the text may become a bit rote. The mother may also anticipate her child’s wishes, unintentionally short-circuiting the conversation. If a brief whimper will produce lunch, why bother formulating a sentence? Out of habit, Mom may use words she knows the child already understands. When Dad isn’t as attuned, it’s natural for him to use new words, thus expanding the child’s vocabulary. The novelty of spending time with Dad may also account for baby paying closer attention. It’s not that dads are better playmates, just that they are different from Mom. Most importantly, stop talking baby talk to your kids! Excerpted from Voice Lessons for Parents by Wendy Mogel. Copyright © 2018 by Wendy Mogel. Used by permission of the publisher. All rights reserved. 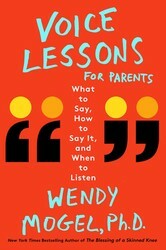 Renowned speaker, parenting expert, and New York Times bestselling author Dr. Wendy Mogel offers an essential guide to the new art of talking to children, showing how a change in tone and demeanor can transform the relationship between parent and child.Most parents are perfectly fine communicators—unless they’re talking to their children. Then, too often, their pitch rises and they come across as pleading, indignant, wounded, outraged. In tone and body language they signal, I can’t handle it when you act like a child. Dr. Wendy Mogel saw this pattern time and again in her clinical practice. In response, she developed a remarkably effective series of “voice lessons,” which she shared with parents who were struggling with their kids.